When Amazon released an update for the Kindle Textbook Creator two short weeks ago, I suggested that Amazon would be making a play for schools. Today they proved me right. The tech company just announced the release of Whispercast 3.0, the latest version of its tool for managing content on a fleet of Kindles and Fire tablets. Launched in 2012, Whispercast lets schools, libraries, and institutions deliver digital content including ebooks and apps to Fire tablets, Kindle ereaders, and Kindle apps on other platforms. It first supported just Kindles, but later expanded to include Fire tablets and Kindle apps. Today Amazon reports that Whispercast is used by "more than 130 of the 250 largest school districts in the US, including my local school district Prince William County Public Schools). They say that over 2,400 higher education organizations—including 24 of the 30 largest in the US - also use Whispercast, including the University of Texas at Austin. And today Amazon has released a new version of Whispercast which makes it even more useful. To start, Whispercast 3.0 supports buying apps and ebooks in bulk via purchase order, and not just with credit cards. Amazon is also debuting a Digital Transition Services. This is a special program which provides K-12 and higher education organizations with the technical assistance and hand holding they need to setup and implement Whispercast. The organizations are matched with Amazon reps which will work with the schools to transition to Whispercast. There are mixed reports that this will be either be a paid or free service, but Geekwire quoted TenMarks co-founder Rohit Agarwal as saying that the Digital Transition Services "isn’t a piece of technology, it’s more human," Agarwal adds — a kind of glue for the tech. “This is not something we’re charging for." In related news, Agarwal became general manager of Amazon Education this month, after joining Amazon in 2013 when the company acquired TenMarks. Agarwal sees the need to do more than simply toss a device on every desk. "We’ve all seen for the past couple of years the trend toward one-to-one deployment of devices" in schools, Agarwal said. "We believe giving every student a device is a great starting point, but it’s not the be-all end-all." And that's where Whispercast comes in. 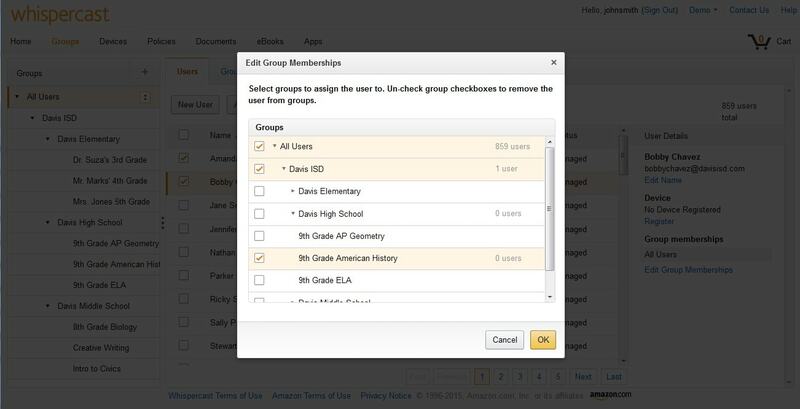 The platform now includes a step-by-step setup wizard which makes it easy for educators to create and manage user groups, add and move users, and purchase digital content and distribute it their organizations. The goal is to make the platform simple enough for anyone to use, and not just the IT dept. To that end, Amazon is also introducing tiered administration to Whispercast 3.0. In other words, the platform now boasts several levels of admin authority. Whispercast admins can now delegate permissions and control to other individuals and groups. For example, a teacher might get the authority to add and manage users, without gaining any other admin power. The school secretary might be given control over purchasing new content, but not be able to set platform policies for the school. Whispercast 3.0 works on the Kindle ereaders and Fire tablets, and it also supports the Kindle app on every platform where it is available (including Chromebooks, Windows, OSX, etc). It is less Amazon's bid to sell more textbooks than it is a direct competitor to Google Apps for Education, and Google's other ed-tech offerings.